When I was from a little girl listen to Vinyl records with my Grandparents here in the UK. Why is Dolly special for you? Becuase she has given me a path to travel down which has taken me around the world, and if it was not for her creative and beautiful song writing and personality I don’t know what I would have been doing now. 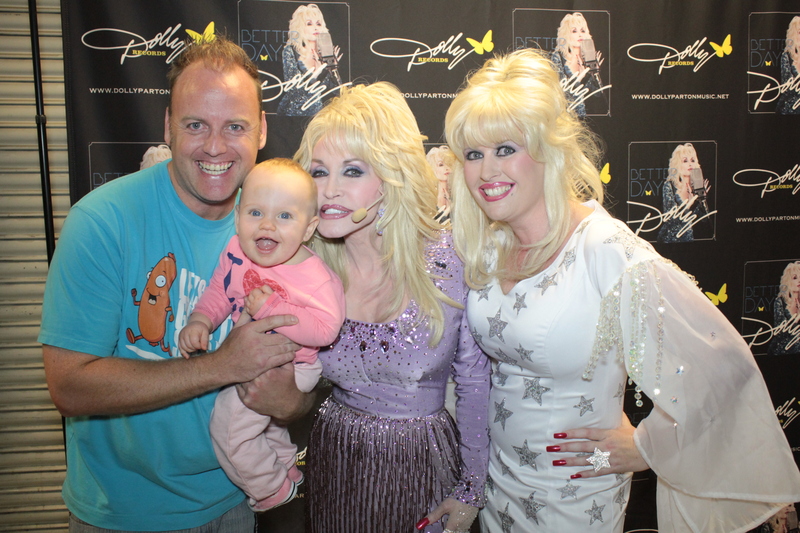 Do you have any dreams of meeting Dolly? 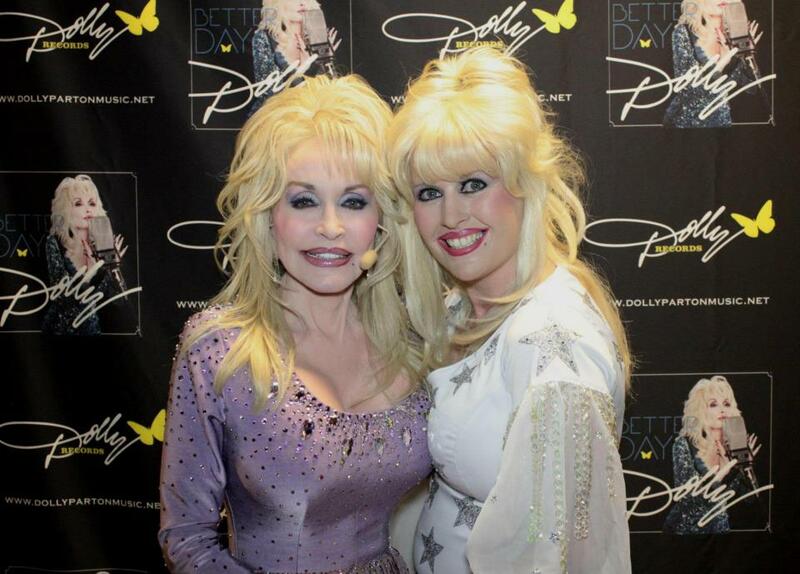 I not only have met Dolly but also worked entertainng her V.I.P’s on her Better Day world tour which was the Ulitmate complement at the O2 Arena London. and oh how the time has flown!! 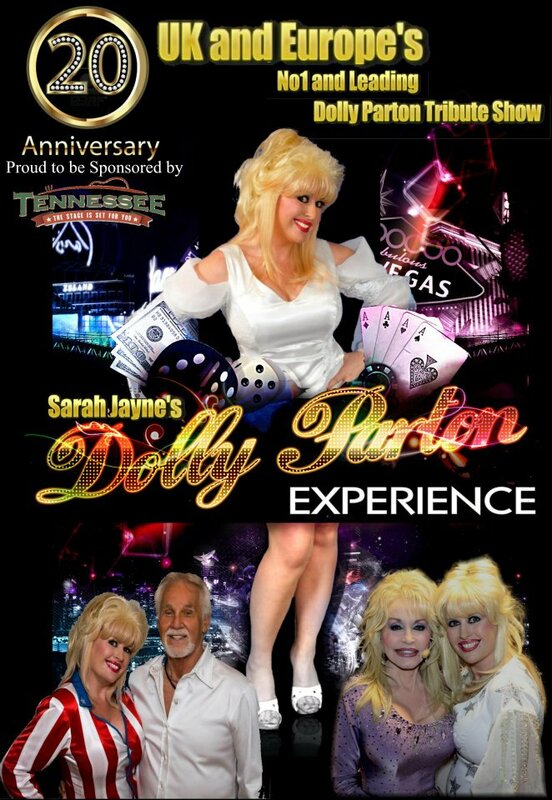 Being Dolly has taken me on a journey that seems to get bigger and better each year, traveling all over the world. Then in 2011 came that Dream call.. Some people would wait a lifetime to receive. 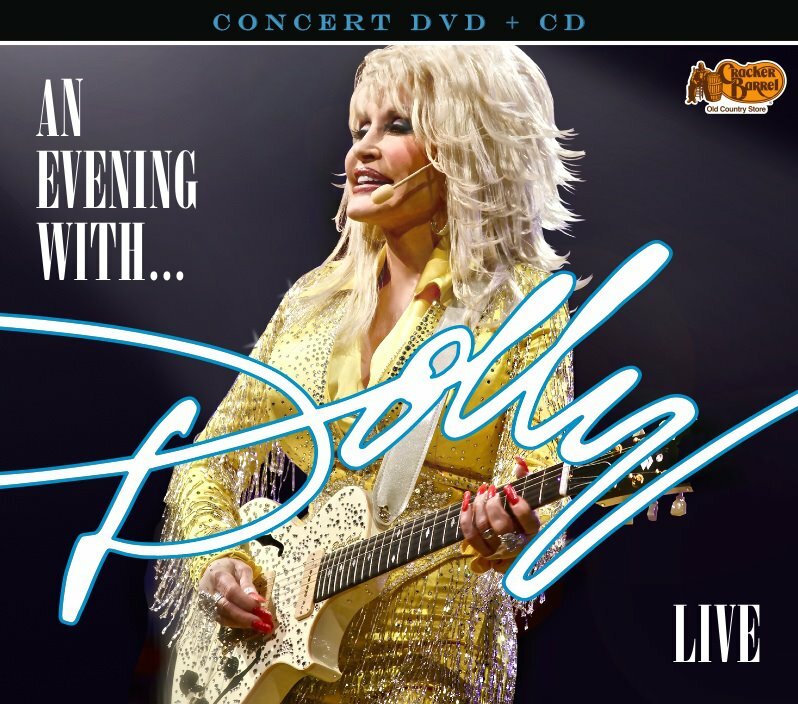 I was offered a Contract in London’s 02 Arena in September 2011 on a night that Dolly was performing her Better Day tour I was intrigued to know more. The agent said that the details were limited until nearer the time an the general brief was that I would be meeting and greeting guests at the 02, just the thought of this, I was very excited.. I decided to get my dress maker to make a replica of the white stars dress that Steve Summers – Dolly’s Dress designer made for her for the Annual Women Who Rock concert To Benefit Breast Cancer in Hollywood. The dress came 2 days before the gig, it fitted perfect and was stunning. Andy, my husband/Kenny Rogers Tribute act I arrived at the 02 and was given VIP parking. Dolly’s tour bus was there in front of my very eyes. We were escorted to the dressing room and was given a brief in the Blue room at the 02. The gig was fantastic and I met some wonderful people that night, all walks of life from Dollyites to Corporate National Newspapers. Also I had the pleasure of watching the show afterwards from a Corporate box, with thanks to Smith and Western and Inbev. Although officially I had stopped working the surrounding box’s asked me in the interval for photo’s and renditions of Dolly’s classic song’s, which I didn’t mind as it seemed to make their experience even more exciting and fulfilling. Andy, Lucy Jayne (our baby) and I travelled to Sheffield and the staff at the Motor-point arena were great! They allowed me to change into Dolly in the wings before the arena opened. On waiting to meet the inspirational, beautiful, Queen of Country we were introduced to Steve Summers who complemented me on my dress..
Graciously I thanked him and excitedly told him it was a replica and he said “Yes I know I designed it! !” with a huge grin on his face. We had spoken previously and I was aware of the work she does for Dolly’s Charity but to meet by chance, here later made a moment in history for me and my family. Fans were queueing impatiently for there ticket s at the box office and we were being looked after by security at the side of the reception. Natalie then asked me if Andy and Lucy were going to meet Dolly too, I said unfortunately no, I was going alone. As you can imagine we were so grateful. We were taken backstage and the band were standing around waiting to take there positions on stage. The hustle and bustle of guitar tuning and the crowds gathering was electric. Dressed in a light purple sequined dress with her immaculate hair, long red nails and the purest of skin she stood infront of us with her everlasting smile..
As I walked towards her she held her hand out and said “Oh my you look wonderful.. Thank you for dressing up again and coming here tonight.. I thanked her for giving me my lifestyle and career.. with out you ‘Dolly’ my life would have taken an unknown path..
We spoke about the time I have spent performing as a Tribute and her Theme Park Dollywood, how Andy and I were engaged there some 7 years ago now and then Lucy and Andy joined us. Dolly put both arms out to Lucy and hugged her close..
Lucy was 8 months old but so aware of where she was, we were sure she knew that it was the real Dolly in front of her..
She was full of smiles and giggles, Dolly told her she was beautiful and Dolly asked Lucy “are you gonna be like your mama and dress like me when you grow up”? I thought, I hope so because if Lucy is as happy in life as I am I’d be overjoyed. I love my job, I love the music, the fans and most of all “I will always love you” Dolly..
As we waved goodbye and security took the 3 of us back to the reception we crossed the side of the lower floor along side the stage in the Arena. Fans saw us and started shouting and screaming Dolly! TO ME! and within what felt like a second the whole arena was cheering and clapping and I stood there waving at the thousands of fans, I was in full view..
Then the dawn chorus played as part of Dolly’s intro and I felt so privileged, excited and mouth wateringly tearful..
Do you have any more goals to make about your dreams? This is my 20th Year as the UK and Europe’s Leading Dolly and my goal is to entertain Dolly Fans around the world for a Further 20 years. If you had the possibility to go out with Dolly, what would you do? I would love Dolly to come to one of my shows and when they annouce me on to the stage Dolly would come out in my place, then I would treat her to whatever and do wherever she wanted to go and do. Saturday’s song is 9 to 5 from the movie 9 to 5. Today’s song from the movie The Best Little Whorehouse In Texas ; The wonderful song Hard Candy Christmas .Enjoy! Music from the New movie Joyful Noise. Enjoy the beautiful lyric in this song…Cheryl Riddle have made this awesome beautiful hair. Love It! The song of the day. Tennessee Homesick Blues from the movie Rhinestone. Enjoy!